Jonathan Borofsky’s “Dreams” （柴山哲也） Do you remember the dreams you had last night? Unless you suffer from chronic insomnia, everyone has a dream when asleep, be it auspicious or ominous. I’m kind of a dream-lover, so l somewhat feel ripped off when I awake from a sound sleep to find I’ve had no dreams. Most slip out of my memory with the ruthless alarm, but there’s sometimes that weird, “what if it might be apocalypse”, dream at the back of my head that lingers after I wake up. Anyway, since l met this book, I’ve written down my dreams, sporadic entries though, which helps surmise who l am, why I do what I do. Now let me talk about my favorite book, Jonathan Borofsky’s “Dreams” (Isshi Press, Tokyo, 1987). He is an American painter and sculptor best known for his drawings or installations with numbers called counting, and public sculptures such as Hammering Man. 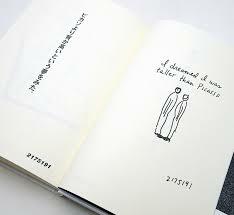 This book with Japanese translation contains his ninety-four dreams with drawings, from a very short one such as “I dreamed I could fly 2009711” to more conceptual ones. In an interview, he refers to what motivated him to start to write down his dreams; “They were fascinating to me and very personal. Many of them give me clues to my own life. I began to see them as my personal contribution to the art world at that time. We had Pop Art, which seemed a little too tongue-in-cheek for me, and Minimal Art, which I could relate my counting to, but I was looking for something more personal, more honest and open and direct.” Not only does he write down his dreams, Borofsky uses them as a subject matter for his works as well, among which is a ruby. 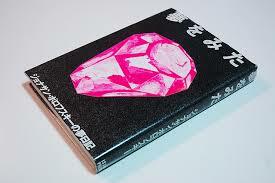 The one “I dreamed I found a red ruby 2457977” is also contained in this book. He says that he remembers it feeling and being like his heart – a beautiful stone the size of his heart – and that symbol was so positive, so spiritually tuned and so beautiful, which helped to balance out a lot of the fearful dreams that he was having – being chased through a city street or whatever. This book also brings back memories of my awkward age, fifteen or something, because I bought it at On Sundays, bookstore in Watari Museum of Contemporary Art aka Watarium, Tokyo, in 1987, when we made a tour of the enticing city. In those days that seemed to flippant boys to be an exhilarating place full of cutting-edge fashion.